Looking for the Ultimate Gift For the Gamer? 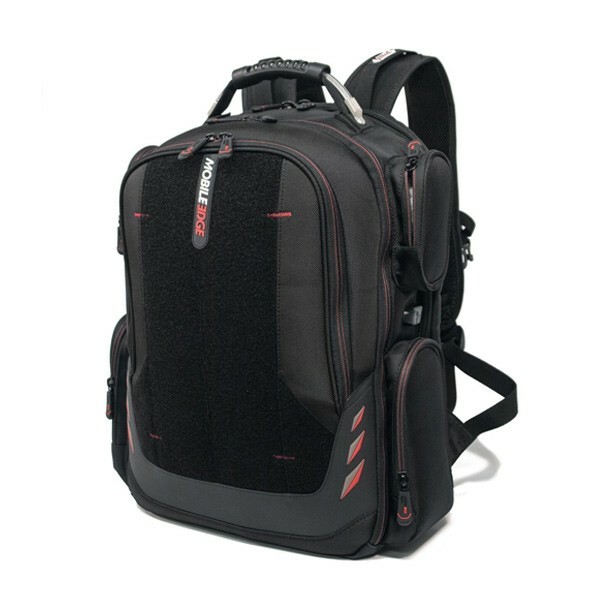 Mobile Edge has it — the New CORE GAMING Backpack! GAMERS for GAMERS DESIGNED AND TESTED, CORE GAMING BACKPACK OFFERS THE PINNACLE OF TRANSPORT, PROTECTION & ACCESS TO COOL TECH! ANAHEIM, CA August 21, 2017 — Back to school is upon us; weather is starting to change and the holidays are right around the corner … take a deep breath. Mobile Edge, an industry leader in innovative and stylish cases and accessories for mobile gaming and computing, has the holidays covered for the gamer in your life. The ultimate gift — the CORE Gaming Backpack is here, thanks to a recently launched Kickstarter campaign — the first for Mobile Edge. Designed, prototyped and tested by gamers for gamers, the CORE Gaming Backpack provides the pinnacle of transport, protection and easy access to the gamers’ laptop, controllers, video games, accessories … all their cool tech, and more! The CORE Gaming Backpack is the first product offered in Mobile Edge’s new lineup of gaming products. To support this effort, the CORE Gaming Backpack is available from now through September 21, with exclusive perks such as Early Bird Pricing of $75 (MSRP $129.99), at www.kickstarter.com. In addition, program backers can select from an additional 10 funding levels to back the CORE Gaming Backpack Kickstarter program, which has an overall goal to raise $30,000. There are some great give ideas here too! With the quite impressive 960 EVO 1TB M.2 NVMe SSD (and their 960 PRO model obviously) Samsung has made it clear once again that they sit at the top of the high-performance solid state drive market. Epson today announced five new affordable Home Cinema projectors – offering consumers versatile options for the ultimate big-screen upgrade. Delivering Full HD images up to four times larger than a 60-inch TV, the new Epson Home Cinema projectors include a range of portable and bright solutions to elevate the big-screen experience for massive movies, sporting events, TV and more – making your home the place to be for friends and families. Home Cinema 2100 and Wireless Home Cinema 2150 Offer Affordable Full HD Performance for Massive Movies, Sports, TV, and More – Ideal for viewing those must-watch sporting events in the living room and hosting family backyard movie nights, the Home Cinema 2100 ($849 MSRP) and Home Cinema 2150 ($899 MSRP) bring immersive entertainment experiences to any room or outdoor space. The Home Cinema 2100 and 2150 offer incredible value and features – including built-in sound, 1.6x zoom, and 3LCD technology for vibrant, rainbow artifact-free images. Additionally, the projectors add vertical lens shift which allows users to place the compact projectors nearly anywhere, from a bookshelf to a table. Epson Home Cinema Projectors Offer Bright and Compact Full HD at a Fraction of the Price of TVs – For consumers on a budget or entertaining in small spaces, the Home Cinema 660 ($359 MSRP), Home Cinema 760HD ($549 MSRP) and Home Cinema 1060 ($649 MSRP) offer affordable, creative solutions – from the compact, coffee table design to delivering huge high-quality images, as well as connected home integration, portability, and setup flexibility. Users can easily connect Blu-ray players, gaming consoles or streaming devices via HDMI® to enjoy favorite content. Taipei, Taiwan－August 22nd, 2017－Thermaltake, a leading brand in PC cooling solutions, is excited to introduce the lastest Pacific PR22-D5 Plus Reservoir/Pump Combo. This combo unit is a high-quality 300ml reservoir with an integrated D5 pump and a software-controlled 16.8 million colors LED cap. The Pacific PR22-D5 Plus Reservoir/Pump Combo is made of POM and PMMA materials, which can sustain the maximum pressure up to 99 PSI, and achieve maximum discharge up to 1135L/hr that offer exceptional performance, unrivalled reliability. Moreover, the LED cap is manufactured with 12 addressable LEDs that are controlled by Riing Plus RGB Software. Functions within the software also allow users to monitor fan performance and track CPU temperature. With multiple mounting options, this comnbo unit is the right choice for PC enthusiasts, making the system a showcase for all to see! Thermaltake Pacific PR22-D5 Plus Reservoir/Pump Combo is now available for purshase on TT Premium online shop. The product availability and price vary by country and region, please contact the local Thermaltake sales representative for further information. With their Vengeance RGB modules Corsair has some seriously good looking DRAM modules on the market. The customer receives an RGB illumination, which in combination with the black heatspreader, looks rather compelling. Apart from that the specs are interesting as well and DDR4-3000 should add a little performance.